Eliminating Resumes: The Lazy Way Out? The Wall Street Journal’s recent No More Résumés, Say Some Firms article highlights a trend that’s been creeping up on us for some time: Bypassing the traditional resume altogether in favor of the job applicant’s web presence. “Instead of asking for résumés, [Union Square Ventures]—which has invested in Twitter, Foursquare, Zynga and other technology companies—asked applicants to send links representing their “Web presence,” such as a Twitter account or Tumblr blog. Applicants also had to submit short videos demonstrating their interest in the position. With so many of us blathering about our lives at the top of our virtual lungs, social media plays a viable part in the overall decision-making process. Why wouldn’t a prospective employer take advantage of checking you out online, especially with a job geared toward the public eye? Where a resume can fail for any number of reasons, the social media piece can push you into the top running for a position–or, of course, drop you out. What I don’t agree with is bypassing the resume entirely. We’re a culture of snap judgments, a world of TL;DR, our senses flooded by imagery, sound bites and a falsely inbred urgency to get to the next best thing. It’s already far easier for an employer or recruiter to weed people out than let them in. Add the social media snap judgment to that, and you could be left with nothing to stand on, disqualified because someone didn’t like your hairstyle or the way you worded a tweet. 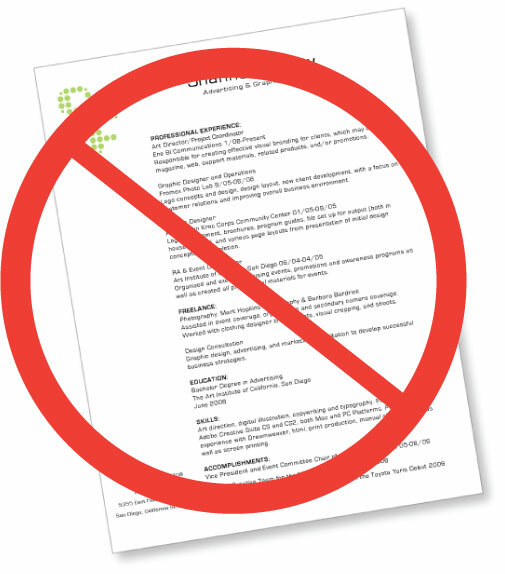 You can’t say “But look at my resume!” if a resume isn’t even wanted. Obviously this goes both ways, as I mentioned before. Your resume may never make it to the hiring manager–but then they find you online, like what they see and call you for an interview. The point is that these snap judgments can sometimes be faulty, and can have a lot more to do with the person looking at you than with you yourself. Social media, while immensely attractive by its immediate availability, still doesn’t give someone the whole picture about you. I’d rather recruiters and employers kept wanting to see the whole package, the static resume as well as the dynamic online presence. What do you think? Would getting rid of traditional resumes in favor of strictly social media be good or bad for job seekers and employers? What have you seen in your job search process? 1. A resume can be tailored for any job out there. So, how useful is it to a hiring manager? i was hired for my current position because it was not who i knew but who knew me. Reputation over written word. 2. A good number of people do things online that, immediately or eventually, they regret. And its not just what we post, it’s what is posted about us. That randomly tagged photo. The ‘It’s complicated’ relationship status. The overly ‘radical’ political views posted by your friends. What’s next? Rumor-monging via FB about your obsession with model trains? Sorry, Becky. Sorta tapped on this one. No apology necessary, Michaela! I don’t think the job search world is going to settle for sure on any side of this issue. You bring up a great point about tailoring the resume. It’s all about what will catch the eye of the hiring manager in those 20 seconds they have to be caught. Hopefully it will be something that makes them spend an extra 20 seconds and then more. About point #2– I would definitely have a problem with someone deliberately discounting me because of something someone else may have posted. Where does that leave all the “you can’t control others” adages? Of course, this also brings up the whole issue of “Would you want to work for someone like that anyway?” which while emboldening to tell yourself (or others), doesn’t necessarily help with paying the bills. That’s a whole other post topic, though.